On Monday Canada announced this year’s seal hunt quota to allow the killing of 275,000 young harp seals near Newfoundland. The announcement sets off the annual round of protests mainly focused on sustainability of the seal population and animal cruelty issues. This feature article was written two years ago but would be little different if done today. The Canadian government increased the annual quota of harp seals (Phoca groenlandica) from 319,000 in 2005 to 325,000 this year. That’s too many seals, says Chris Cutter, an activist with the International Fund for Animal Welfare (IFAW). An unusually warm winter has left little ice in the Gulf, Cutter told Tierramérica after a helicopter overflight last week, before the hunting season began on Mar. 25. “We hardly saw any seals,” he said. 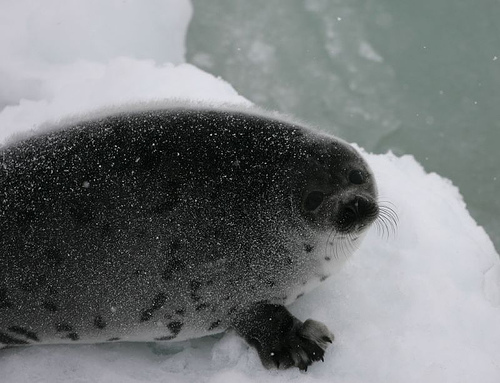 Named for the harp-shaped pattern on the backs of the adults, the seals mainly give birth to their pups on floating ice, where they are safe from land-based predators. Young seal pups are able to float, but are poor swimmers and often drown in rough weather. The harp seal herd is about 5.8 million, with an estimated one million pups born each year, says Phil Jenkins, spokesman for Canada’s Federal Department of Fisheries and Oceans (DFO), which regulates the hunt. Photographs of McCartney and his wife posing with cute, white-coated seal pups have been broadcast around the world. It has been illegal to hunt white-coat pups since 1987. 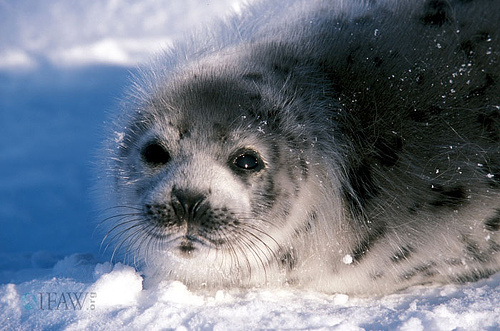 Seal pups lose their white coats about 12 days after birth and are three to eight weeks old when killed for their short, flat fur that can fetch 70 dollars a pelt. But the debate about the sustainability of the hunt is nowhere near as contentious as the issue of animal cruelty. Every year, hundreds of animal activists and journalists from Europe and the United States come to this cold and stormy part of Canada to protest and witness the bloody spectacle of thousands of young seals being shot or clubbed to death, and then skinned on the white ice. Sometimes the animals are still alive while they are being skinned, says Cutter. “The hunt isn’t pretty to look at, but killing animals never is,” says environmentalist Lori-Ann Martino, from the town of St. John in Newfoundland province. Most of the seal hunters are from Newfoundland, where sealing and fishing have been the main livelihood for hundreds of years. “Most Newfoundlanders are animal lovers and 90 percent of the people here support the hunt,” Martino told Tierramérica. ← Denial and Delay: Tips on Detecting Global Warming B.S.